Published on April 14, 2014 by . A musical offering of Sri Chinmoy’s peaceful and uplifting compositions performed by local and interstate singers and musicians was offered at the at the ‘World Peace Dreamer’ statue in the scented gardens of Sir James Mitchell Park in South Perth, Australia, on Saturday on March 15, 2014. The statue depicts Indian born Sri Chinmoy (1931-2007) in a meditative pose and honors his efforts to foster global peace. “Peace, means a flood of love in the world family,” he said. “Sri Chinmoy was most well known as an artist, musician, spiritual master and for offering meditations at the UN headquarters in New York for over 35 years to the staff and delegates”. The performances were part of a celebration of the third anniversary of the statues inauguration and to honour Sri Chinmoy who arrived in the West from his homeland 50 years ago. The free event was attended by South Perth Mayor Sue Doherty (see picture). 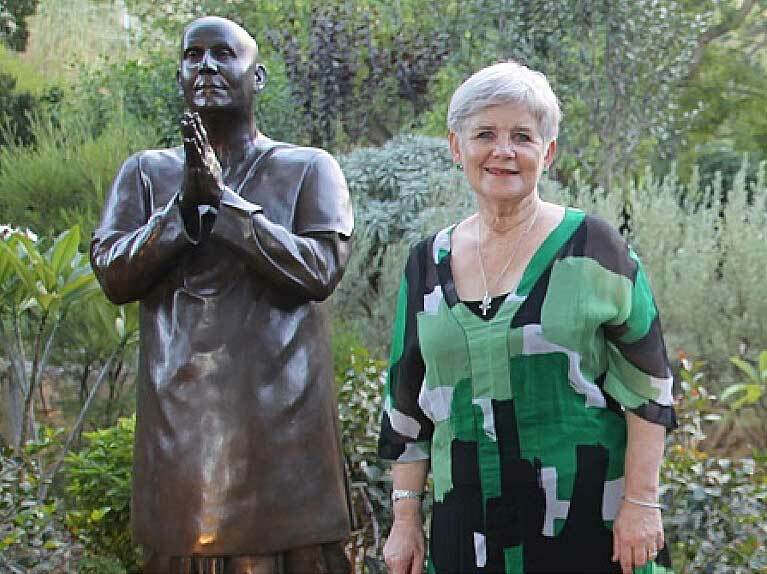 She said, “We are very, very lucky to have this statue here in South Perth overlooking the city,” Doherty commented. “I often come and pass by here, it is a special place”.